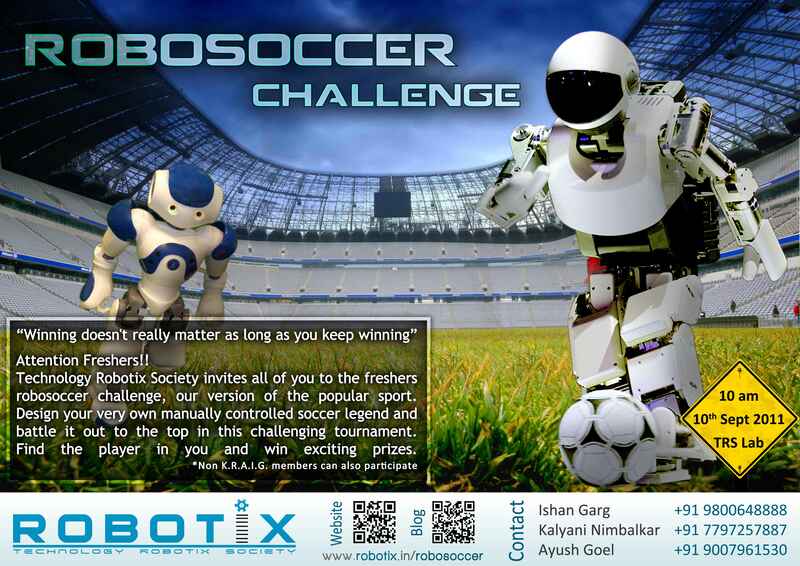 Freshers' RoboSoccer Challenge 2011 ! The Freshers’ RoboSoccer Challenge conducted this year turned out to be a delight with participants being mighty enthusiastic about making and playing with their very first Robots! Though in principle these robots were merily differential drives, in order to survive in this challenege, creativity and experimentation with designs were key components. This challenge had a Knock-Out format with the number of matches being the logartihmic function of the number of participants to the base two ( Too much of Math eh? Well..we’re IITians you see ). This Freshers’ event was the first one this season for the new KGPians who were just introduced to the crazy world of Robotics. For all those who missed the opportunity to participate in this event, do not be disheartened! Yes, you guessed it right. There is a Second in-house Robotix event going to take place on our campus soon. The problem statement of which would be revealed in due course of time. The Winners of this challenge have also been given a direct entry into the second round of the next event being conducted by Team Robotix! To know more about who we are and what we do, visit our website @ www.robotix.in . Be sure NOT to miss out on the next event . Exciting things are bound to happen.. Where Machines Dare!!! To know more logon to our site www.robotix.in or check out https://2016.robotix.in/robosoccer .